Percussionist Ray Cooper makes a lasting impression on fans every time he picks up an instrument on stage or in the studio. Ray studied classical piano as a youth, then strings and woodwinds, and later, percussion. He also trained in the theatre arts before beginning a career as a session musician in the 1960s. He joined the popular British band Blue Mink in the early ’70s and played on hits by America (A Horse With No Name), Carly Simon (You’re So Vain) and David Essex (Rock On), as well as on many other projects. Ray originally worked with Elton in August of 1971, on the Madman Across The Water album, and first joined him on stage at the Royal Festival Hall show six months later. In late 1973, Ray joined Elton’s stage band and played at his Christmas shows at the Hammersmith Odeon. The following month he joined the band full-time in Colorado for the album Caribou. A tour followed, and Ray immediately won fans over with his rambunctious stage persona, tambourine-tossing and a duck call solo on Honky Cat, often getting the biggest applause during the band introductions. For six nights in 1977 at the Rainbow Theatre in London, Elton and Ray introduced a unique stage show that would become a thing of legend. Selecting more obscure songs from his catalogue, Elton played a solo set to open the show, and then was joined by Ray on percussion for the second half. Following Elton’s semi-retirement from stage shows, this two-man show was relaunched in 1979, when the duo played smaller venues for multiple nights around the globe over most of the year, including eight high-profile nights in the USSR, one of the first times a Western act had played the Communist country. Ray continued to perform and record with Elton sporadically through the 1980s, once again bringing his showmanship to the Australian Tour De Force concerts with the Melbourne Symphony Orchestra in 1986. During the ’80s, Ray also played in the studio or on stage with George Harrison, Eric Clapton and Mick Jagger, among others, and began to work in film (as musician, actor and producer), most notably with director Terry Gilliam. In the summer of 2008, Elton and Ray began discussing a reunion of the two-man show, which had not been performed in 14 years. The two friends returned to the stage on September 22, 2009 at the Royal Albert Hall in London with a benefit for the Royal Academy of Music, which both Elton and Ray had attended in their youth. 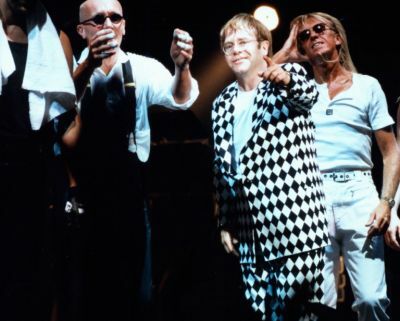 This show began a two-week tour of France (with one show in Milan, Italy) and since then Elton and Ray have done engagements in Hawaii, South Africa, Monte Carlo and beyond. When Elton launched the Million Dollar Piano show in Las Vegas in the fall of 2011, he was sure to include Ray into the full band, selecting two of the more popular songs from their tours together, Indian Sunset and Better Off Dead, to showcase the percussionist’s abilities.